It is no secret that I thrive on catching rays of sunshine. I have come to enjoy it even more when my dog Valentino catches a bit of sunshine for me. 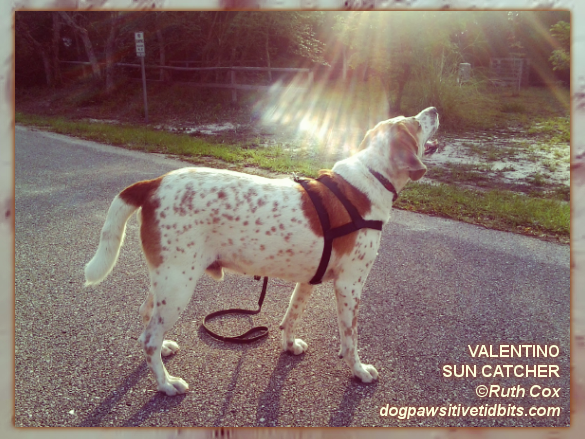 On this day as we took a dog walk under the setting of the evening sun, my dog Valentino stopped in stride to gaze into the rays of the sun. Then he turned to me with a smile as if to say, "Did you catch that, Mom?" You bet I did! Now, if I could just find an American English (Redtick) Coonhound on dog suncatchers! There seem to be ornamental dog sun catchers available on Amazon in a variety of breeds but I have yet to find my breed of hound dog pictured on one. 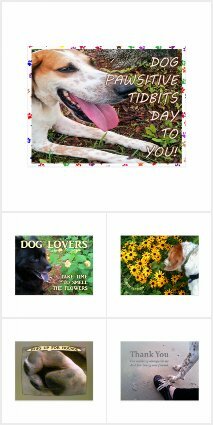 Click any of the links above to see if you find your breed pictured on the dog house suncatchers. And please let me know if you find my coonhound on a sun catcher! We know many of you are busy with Happy 4th of July sun-catching celebrations today, but that's okay. 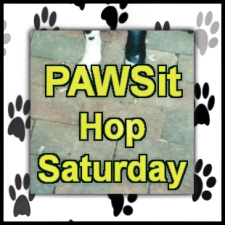 You can add your dog-related articles to this PAWSit Hop Saturday list anytime throughout the week. Hop along with us! Get the InLinkz code for your PAWSit article.